Donald Miller’s famous Blue Like Jazz hit the New York Times Best Seller List in 2006. However, I think his latest book, A Million Miles in a Thousand Years, might be his best to date. It opens with an interesting premise, as two hotshot Hollywood moviemakers decide to make a film about Miller’s life and begin “editing” his real experiences into a better “story” that will create the proper tension and excitement to appeal to their audience. Of course, this forces Miller to wonder if he shouldn’t be living a better story on his own. 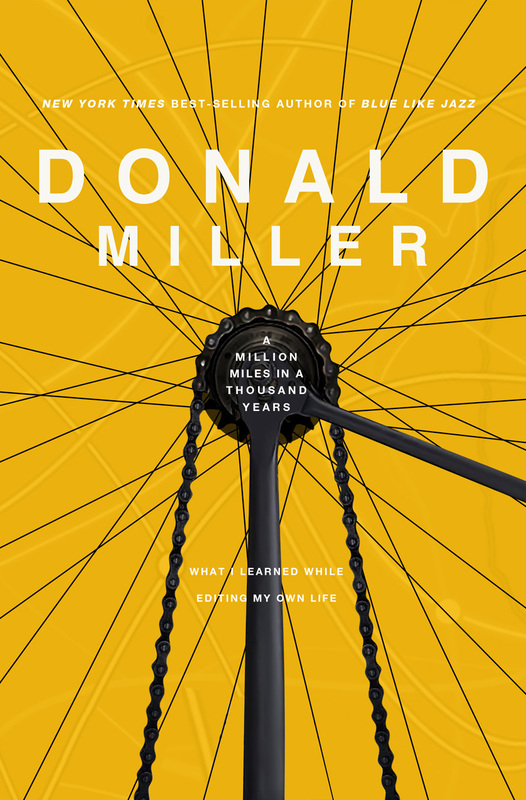 Using the techniques of narrative structure, Miller takes a hard look at his life, past, present, and future, and decides it is time to begin living a story that will matter and make a difference. Through the pages of the book, he contacts his father for the first time, he looses weight and gets in shape to bike across country, he starts a nonprofit organization, and he finally goes after the girl. In chapters such as “The Elements of a Meaningful Life,” “Imperfect is Perfect,” “A Character Is What He Does,” and “An Inciting Incident” Miller allows us to join in his quest towards creating a better existence. His experiences challenge the reader to not only face, but to invite obstacles and struggles into their lives as a source of transformation. He encourages them to take the time to create memorable scenes and to see the beauty in tragedy. The parallels in this book hit home and encourage the reader to want to live a better story as well, while keeping in mind that in real life, our stories don’t resolve here on earth. This week at the Inkwell we've been talking about heroes, and I think Miller certainly fits the bill as he courageously reconstructs his life. Miller also went on to become a member of The Presidential Task Force on Fatherhood and Healthy Families. So Miller is now making a difference in the lives of countless others as well as in his own. As a writer, I especially enjoyed this book. It provided a unique experience to learn more about narrative structure in a fun context. Somehow, seeing the elements of storytelling illustrated in Miller's life helped me to gain a better understanding for them. As usual, this book of Miller’s draws from his actual experiences and reflections, tying them together with truths that are both spiritual and yet incredibly practical. His style is engaging and personal. He provides many poetic moments along with plenty of humor. I highly recommend this book. What could you change in your life in order to live a better story? For me, it's: More time in the bible. Floss each day. Stop wishing for tomorrow to hurry up and get here. Take it easy once in awhile. Thanks Dina. I can see why this book may have added to your desire to take inventory of where you've been and where you're going. Good thing to do once in awhile. God bless your new decade! What a fascinating premise for a book. And it poses a question that's both big and small. Thanks, Dina for the into to this book. Sounds fascinating. I'm busy, busy today. Dance recitals on and off from 10am to 11pm. And as Deb hinted, I just turned 40 this week. I've really felt this year that the thing I want to do more of is mission and outreach work. "What you've done for the least of me you've done for me," type of stuff. We've gotten involved in a soup kitchen for starters. This book and The Passion of Mary-Margaret where both influential in this area. Did you read Quaker Summer? What would I change in my life to live a better story? Yowza, that's a thinker! I think I would worry less about what people thought of me. I wouldn't let fear of failure or of looking stupid stop me from doing things I felt I was supposed to do. It's something I still struggle with today. Haven't read Quaker Summer yet, but Embrace Me is on the TBR shelf. Jennifer, sounds like a good plan. I say go for it. I can't wait to get my paws on this book! If I could change anything to make my story better... I would be more consistent. Sadly, I never outgrew being fickle. I'm guessing you're one of those creative free spirits, Bex. Sometimes those things we consider flaws are actually the flip side of our gifts. We just need to learn to keep things in balance. I can see why this book may have added to your desire to take inventory of where you've been and where you're going.